Before giving it all up and buying that plot of land in France, I’d advise you read Grape Expectations: A Family’s Vineyard Adventure in France by Caro Feely. Caro and her husband Sean originally from South Africa but both doing something lucrative and consultative in Dublin bought, seemingly on a whim, a run-down estate in Bergerac. 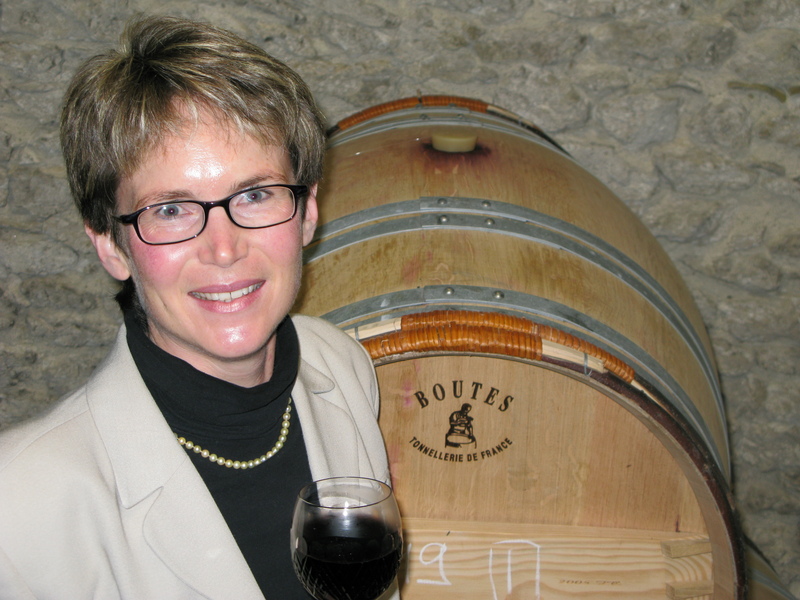 Neither of them have any experience of viticulture and they have two young children. It almost ends in financial, medical and matrimonial disaster but by luck and determination/ bloody-mindedness they have made the estate a success. I found the sheer complexity of running their domaine fascinating. The wines of Chateau Haut-Garrigue are now available in Britain and Ireland and have picked up some good notices in the press. I’m particularly looking forward to trying their Saussignac, a sweet wine made with nobly-rotten Semillon and Sauvignon grapes. Caro Feely has very kindly agreed to take part in a Q&A. When did you first realise that wine was something special and can you remember the wine that triggered this feeling? When I was about 18 and in my last year at school my sister Jacquie introduced me to good things like Boschendal Blanc de Noir and Twee Jonge Gezellen TJ39 and less fancy wines like the famous Tassies or Tassenberg – a favourite of students in SA as a local song goes: ‘dis nie goeie vyn dis nie goeie vyn maar dit proe eerste clas,’ (my afrikaans spelling is no doubt incorrect so apologies) ‘it’s not good wine its not good wine but it tastes first class’ especially when you are a student on a tight budget. Then in my first couple of years working in Johannesburg I shared a house with a fella who was a master of wine and he had a cellar worth about 10000 euro in the house: a source of more fine education on wine. This was probably when I began to understand just how much variety and interest there was in wine and it was around that time I met Sean whose grandparents had been winegrowers in the Cape. Before your change of career, what was your favourite wine region? I don’t recall being particularly for one region or another. I loved the wines of South Africa like Springfield Life from Stone and Fairview’s Mourvedre blend, wines of France from the small producers in Languedoc, Loire and Bordeaux. You don’t flinch from describing quite how hard the life of a vigneron is; if you knew then what you know now would you have bought the property in Bergerac? No way! But I am pleased I didn’t know and that we did it as I think we are ‘stronger steel’ having been through the fire now. You also don’t flinch from criticising your husband Sean. How did he react when he read the book? He knows he can be pig-headed sometimes… He thinks it’s a good book. Being an ex-journalist and English major for his first degree he’s one hard task master. His reaction to an early draft was far from positive but hard feedback from him and 2 other journalist friends were necessary but nasty medicine to helping me find my voice. You have taken to biodynamics in a big way, what do you think yourold self would say about ‘crystal spectrums’ and burying cow horns in the ground? I was very sceptical. I think once you have worked with nature everyday the way we do it is impossible not to be convinced. When I walk out and smell extremely strong floral perfumes I know it is a flower day and hey presto the calender confirms it is, when I smell super earthy smells it is a root day. I could go on for hours… There is way more to life than our current tunnel vision approach to science explains. For the wine tours and classes we offer I talk biodynamics very practically. From reading your book, I can tell that you take enormous care over every aspect of the wine-making process and yet you machine harvest for most of your wines. Do you think there is a contradiction here? We do about half and half. The higher volume production like our core merlot and most of our dry white are machine harvested. This is because these are picked relatively early in the season so there is generally less need for sorting (no rot – although we do do what we call a negative pick by hand to remove what we don’t want harvested the afternoon before eg unripe or overripe bunches). It also means we can harvest in the cool night and being mid-September days can still be very hot. Hot harvest means more oxidation more need to SO2, more manipulation and shock to cool it in the winery and potential cooked aromas. We don’t want this. For us for the moment this is the good solution but overtime we would like to find a way to be able to hand harvest everything. There are pros and cons to the two options. For the top end reds where we harvest later and for the dessert wine it is all hand picked as here it is more important to sort bunch by bunch and even berry by berry (as with the Saussignac) plus the days are a bit cooler (October). Who makes wine that you admire? Are there any wines/ regions/ countries that you avoid and if so why? We tend to drink only organic and biodynamic wines knowing what we know about what goes into the rest…. What is the most that you have ever spent on a bottle of wine, what was the wine and was it worth it? For one of the grand cru classé classes I gave at our wine school . I bought a Mouton 93 for around 240 euro and it was interesting for the occasion but I wouldn’t buy it for myself (I see it is worth way more now so maybe I should have held it to resell!). What are you most looking forward to drinking from your cellar? A client gave me a bottle of Pontet Canet 2006 (organic and biodynamic grand cru classé Pauillac) that I am looking forward to drinking. I tasted it at the estate a couple of years ago and it was superb. This entry was posted in Interviews, Wine articles and tagged Alsace, Pinot gris, Riesling, South Africa. Bookmark the permalink.